From boat maintenance to route planning, there are a lot of pieces to manage if you want to operate a safe, comfortable cruising program. We’ve tapped our team of experts for tips that will get you and your crew ready to slip the lines from the dock. Over the next few months, we’ll release installments of our Ultimate Cruising Playbook with templates, articles, and blueprints to set you up for success. In this installment, Quantum’s Andrew Waters looks at the bones of the operation: the boat and sails. Creating a comprehensive maintenance plan is key to successful and enjoyable cruising. Yes, getting a good crew and mastering important sailing techniques and honing navigational skills are important, but it all starts with the boat and sails. Use this guide to create a maintenance schedule and fail-safe checklist. Preventive, proactive maintenance leads to a safe and enjoyable time on the water. Being proactive will set you up for a much better experience on the water, not to mention reduced stress levels! With regard to maintaining your sails, you have to take into account the fact that sails change shape over time. I highly recommend you take photos of your sails at periodic points throughout the season and send them to your sailmaker. The photos can become a timeline and database kept in your file. Your sailmaker can use the photos to make suggestions for minor adjustments that will maintain the most desired sail shape. It is also critical to take care of your sails after use. Your sails will last much longer if you make sure they are dry when you put them away after a day on the water. If you plan to store them onboard, consider running a dehumidifier. Along with correct flaking and storage, running a dehumidifier will lengthen the life of the sails. A cruising sail is no different than a racing sail. It is designed to give the boat its best performance and help you sail with efficiency. 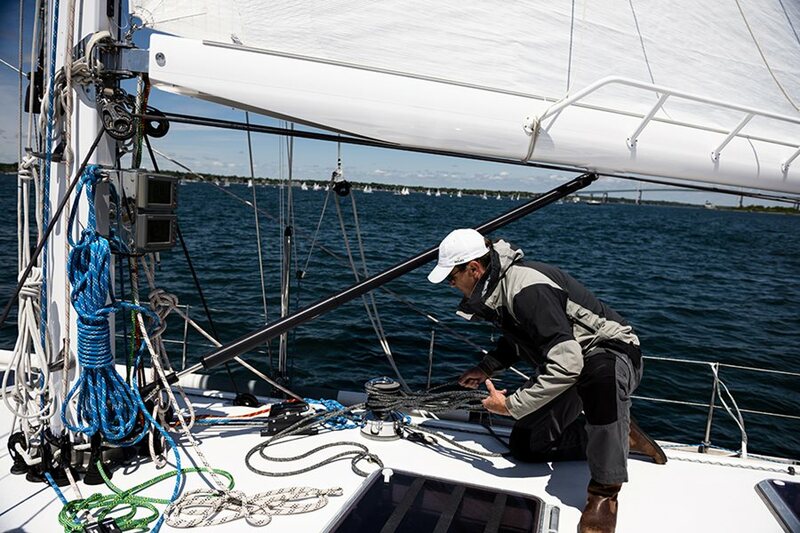 Protecting your sails is an important step towards improved performance and efficiency. Inspection of your standing rigging by a rigger or a surveyor on a routine basis is always a smart idea both for safety reasons and to ensure the rigging matches your sails. Next, look carefully at your deck hardware, lines, and fittings. Look for worn areas, loose screws, and UV damage. Even a seemingly minor hardware failure can be catastrophic for sails, lines, and the deck. A reminder for saltwater sailors: It is important to rinse the boat at the end of every sailing day to get the salt out of the fittings. It is important to implement an anti-fouling/hull cleaning routine to keep growth off the boat. Speak to local experts about what methods and products work best in your region. A clean hull will improve and satisfy a day’s passage-making--and don’t forget to clean the prop for motor sailing on calm days. Inspection of your electronics and all systems on the boat needs to be included in your maintenance schedule. Check GPS, radio, safety equipment, water on board, and other items that you may need to rely on in the event of an emergency or to satisfy local, regional, or international authority requirements. Involve your crew in this process so there is less worry. Make sure to have your engine serviced regularly, with routine checks of the oil, belts, and impellers. Post a pre-sail checklist on the bulkhead so important steps don’t get skipped. For boats in northern climates, winterizing the engine and water tanks is a critical part of winter storage. For specific details related to your engine, make sure to read your boat’s owner's manual. Follow the instructions and maintenance schedule as closely as possible. Keep the manual on board at all times, and, when in doubt, refer to a knowledgeable marine mechanic. Add to the enjoyment of the sailing experience, keep you and your crew safer, and reduce the chances of a breakdown on the water by practicing regular boat and sail maintenance. Be safe, sail comfortably, and enjoy. If you’re just starting out and are in the market for a new boat, keep in mind long-term maintenance when selecting the right boat. This often isn’t given enough thought when purchasing a boat, but it can make a big difference down the road. It is also important to make sure the boat you buy matches your abilities and knowledge. For example, if you plan on going blue water cruising, you don’t want a boat that does not have the pedigree or proven track record. Likewise, if you’re only going to be local water cruising and may be shorthanded, you’ll want to make sure you can handle your boat easily and efficiently.